If you count every part down to the smallest screw, there are about 30,000 components that make up the average car. That’s a lot of parts and just like the human body, if not maintained, many things can go wrong. One of your vehicle’s hardest working parts is the exhaust system. According to Wikipedia, an exhaust system is usually piping used to guide reaction exhaust gases away from a controlled combustion inside an engine or stove. The entire system conveys burnt gases from the engine and includes one or more exhaust pipes. The job of the exhaust system is to reduce noise and carry exhaust toxic gas away from passengers in the vehicle. This toxic gas is mostly carbon monoxide, a very dangerous gas which can cause death if it is inhaled in even moderate doses. 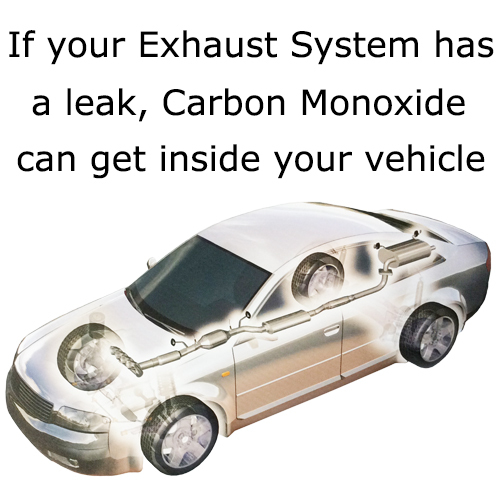 It’s important to have your exhaust system checked for leaks because if there is a leak, the carbon monoxide gas could be entering your vehicle through holes or openings in the floor, rear of the vehicle, or through the vents. Each year people die from sitting in an older car that is idling (with a leaking exhaust system) and there have been reported deaths of children riding in pickup trucks under a topper from carbon monoxide poisoning. Even a small leak can cause elevated carbon monoxide levels in the body and studies show that this will interfere with driving ability. Carbon monoxide intoxication will impair your ability to operate a vehicle, cause confusion plus slow and/or irrational thinking. A leaky exhaust system can cause anything from a small ticking noise to a very loud sound so it is not always obvious. Depending on the the materials used in your vehicle’s exhaust system it can start rusting through in as little as 4 years. It is smart to have your exhaust system checked as it is better to be safe. AAMCO of Bonita Springs is a Napa Auto and Truck Service Center and would be happy to check out your exhaust system to see if there are any leaks. Just give us a call or request an appointment online. Previous Previous post: It’s All About the Brakes! Next Next post: Is your Vehicle at Risk for an Engine Oil Sludge Breakdown?